Last night was the annual "Dancing With The Stars" Oxygen Ball, a fundraiser presented by the American Lung Association In Florida. Michelle and I want to thank everybody who voted for Michelle and gave money to such a worthy cause, every dollar helps. I might be a little biased, but I believe Michelle rocked it last night! Here's a video of her performance. Last night's event was sold out, and we saw so many people there that we knew. I think Michelle recruited her own fan base (at least it sounds that way when you play the video). If you missed last night, it's not too late to show your support. 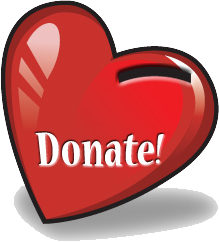 All you have do is click the heart at the right and it will take you to a donations page where you can give as little as $10 or as much as you want. While we thank everybody who has supported the American Lung Association, we also want to thank the dancers. These "celebrities" didn't just show up and dance, they spent the last few months rehearsing and raising money. This years dancers included my wife Michelle Manausa, Kim Campo (the Champion fund raiser), Brandi Van Leuven, Berneice Cox, Representative Alan Williams, Greg Gaskin and Ernie Sims. All of them are to be commended for the hard work and preparation that went into last night's Oxygen Ball event.